There are plenty of smartphone docks available to purchase to help charge and present your smartphone screen for easy reading when notification arrive. But all these are very boring when you compare it to Indi, a robotic smartphone dock created by Billy Wood based in the UK. 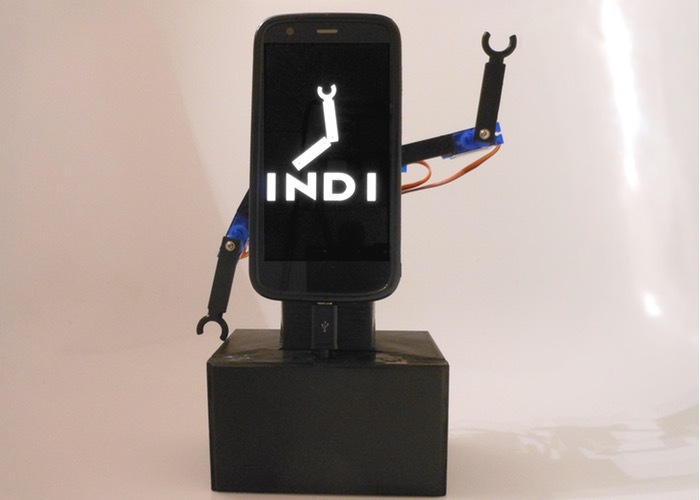 The Indi robotic smartphone dock has been created to equip your smartphone with a pair of robotic arms that the dock uses to communicate different notifications to its owner as they arrive. “All through my career I have had to work in the sort of offices where you are expected to put your phone on vibrate mode. Which is all well and fine, except that more often then not I would end up missing calls anyway, too focused on my work to notice the buzzing and the mobile slowly moving across my desk. This is my solution to that problem. A phone dock with a set of arms to signal the user when a call comes in. Something more likely to catch your attention while not alerting the whole office to its presence. Aside from this, I see this as potentially useful to hard of hearing smart phone users, or as just a cool thing to have lying around and show off. I’m looking for backers to pre-order the device, allowing me to plan the manufacturing around the inventions demand, while also giving me a chance to collaborate with them over potential improvements and new features. The Indi project is currently over on the Kickstarter crowd funding website looking to raise £2,500 pledges to make the jump from concept to production. So if you think Indi robotic smartphone dock is something your smartphone could benefit from, visit the Kickstarter website now to make a pledge from £35 to be one of the first to own the Indi.